Compare Blenders: Countertop or Immersion? Blenders are very useful kitchen gadgets. They can be used to prepare purees, soups, smoothies, baby meals, sauces, deserts and just about anything else you can imagine. When you compare blenders before you get your own, you may be wondering whether you should get the countertop or the immersion (also known as handheld or stick) model. 1. What will you be using most your blender for? 2. Under what type of conditions will you be using your blender? The following will detail the points to consider when you compare blenders before you get the correct type of blender for your needs. With a handheld blender (also known as immersion blenders) you are not limited by the size of the blending bowl you are using (as opposed to a countertop blender which requires the use of the bowl that comes with it). Because the blending can be executed directly in the cooking pot, you are allowed to work with larger amounts of liquids and soft ingredients. You are really only limited by the size of the cooking pots you own. In addition, because you are directly blending in the cooking pot, you are allowed to work with hot liquids and ingredients. This is quite useful and time saving when you make soups. The handheld blenders do not really need any counter space for storage as they can easily be hidden away in a kitchen cabinet or drawer. So they are quite suitable for small kitchens with little counter space. Handheld blenders come nowadays in cordless versions which are very suitable for traveling and camping. Because they are so small they can easily be carried to your camping or vacation site in a bag and run on battery . Cleanup is much easier with handheld blenders as there is no additional bowl and lid to clean. 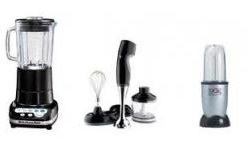 Handheld blenders are very good for blending liquid and soft ingredients. But they are not adapted to blending efficiently harder, larger and thicker ingredients even when the additional attachments that come with some brands are used. If harder, larger and thicker foods are to be blended, a countertop blender which is better equipped to achieve thorough grinding or pureeing should be used. So, when you compare blenders, you should carefully consider what you will mostly use your blender for, and the conditions under which you will be using it. Of course, if you can afford it, you could also get one of each type so that you would be properly equipped with the right type of blender no matter what the cooking requirements and conditions might be. You will find below popular blenders of both types offered on Amazon. Click the Amazon product links below to check the price and product information of the selected immersion blenders. Amazon often provides a good discount on the List Price of sold products. If a discount is available, the List Price and the actual Amazon price will be shown when you click the images below. 2 speeds for all your blending tasks. Powerful 200 watt motor handles more blending tasks. Stick design reaches into pots, pitchers, and bowls to extend blending options. Dishwasher-safe blending shaft and beaker. Operates with a one-touch control for easy, one-handed blending; Limited 3-year warranty. 2-speed 200-watt hand blender with 2 attachments. Blending wand purees soups, whips milk shakes. Stainless-steel whisk perfect for batter and whipped cream. The Removable 8" Blending Arm locks into the motor body for easy operation. The soft grip handle offers a non-slip grip when continuously blending ingredients. Click the Amazon product links below to check the price and product information of the selected countertop blenders. Easy-pour spout ensures mess-free serving. No more ice chunks - the wave-action system pulls the mixture down into the blades for smooth results. Dishwasher safe 40-ounce boroclass heat resistant glass jar. Powerful 1.3 Horsepower blender with die-cast metal housing. Preprogrammed Smoothie, Ice Crush, and Pulse functions, and Low and High Speeds. Large 64-ounce BPA free Tritan co-polymer lidded jar with measuring marks. Simple control panel with backlit buttons; count-up timer; stand-by mode.​ Measures: 7 x 9.5 x 16.5 inches..
One-piece construction means no need to remove blade for cleaning. Clean-touch control pad features intelli-speed controls that let you easily customize your blending job. Durable die-cast metal base with steel reinforced coupler, 120 volts, 0.9 horsepower motor. When you click you will have a choice of many colors.